Allergies to cow’s milk has become a common ailment among infants, which has led parents to opt for formula feeding. The U.S. Food and Drug Administration (FDA) estimates over 1 million infants being fed with formula instead of breastfeeding in the U.S. currently. The FDA further foresees over 2.5 million infants to rely on formula until they are 3 months old. Wide variety of formulas have been developed for young infants with different tolerance limits, such as soy-based formulas and amino acid-based formulas. Although soy-based formulas might be recommended in light of their lactose tolerance or cow’s milk protein tolerance, the American Academy of Pediatrics considers their use for feeding preterm or low-birth-weight infants unadvisable. Amino acid-based formulas however are considered to be the first preference in infant formulas, as they can be fed to new-born as well as young infants intolerant to casein hydrolysates, soy protein isolates, and cow milk proteins. A new Transparency Market Research (TMR) report foresees the global amino acid-based formula market to record an impressive 8.7% value CAGR through the forecast period, 2017 to 2026. 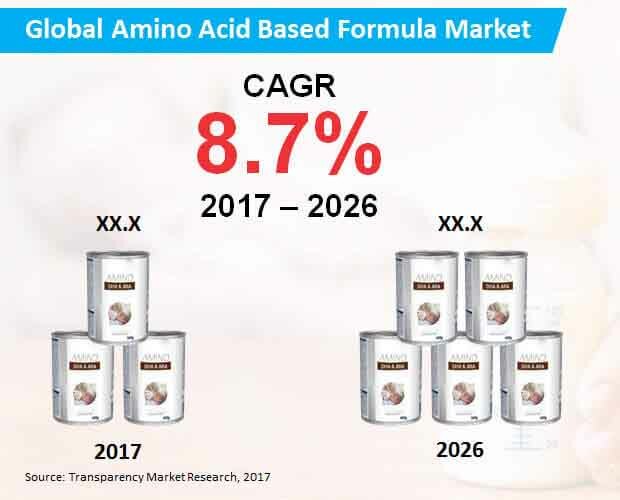 Volume sales of amino acid-based formula worldwide is pegged to surpass 15,400 tons by 2026-end. Population across the globe has been witnessing a rise, driven by rising birth rate in developing nations, coupled with efforts of developed countries to enhance birth rates. Number of hypoallergenic disorders in new born and young infants has also been increasing abreast rising birth rates over the past couple of years. UNICEF and the WHO estimate over 2-3% of young infants across the globe to be affected with hypoallergenic disorders, leading them to become intolerant to cow milk proteins. This has further driven demand for effective infant formulas, with amino acid-based formula being the first preference among parents worldwide. With several authoritative organizations and governments around the world taking efforts for improving outcomes of CMPA and hypoallergenic disorders, demand for amino acid-based formulas will further gain an uptick in the near future. Most of the infant formulas based on amino acid have a slightly bitter taste, with limited flavors. This has further reflected on consumer hesitation and consumption rejection of infants significantly. Infant formula manufacturers are therefore developing new formulations to equip various flavors that would be appealing to infants and relieving stress off busy parents. For example, Neocate Junior, nutritionally complete and powdered amino-acid based infant formula has been introduced in the market with various flavors such as strawberry and vanilla. Several other manufacturers are also focusing on leveraging the opportunity to develop innovative flavored infant formula products, in order to increase their market reach. Over the years, infant formula manufacturers have made several improvements in their products, by adding or adjusting ingredients in response to research developments and trends. Additionally, these manufacturers adopt attractive packaging solutions such as ready-to-use plastic bottles having easy-to-grip shapes, for providing convenience to busy parents in carefully tending to their children. Key companies contributing to expansion of the amino acid-based formula market include Ausnutria Dairy Corporation Ltd., Abbott Laboratories, Danone, Mead Johnson Nutrition Company, and Nestlé S.A.